Ger Aylward won’t feature for the Cats this year, manager Brian Cody has confirmed. KILKENNY MANAGER BRIAN Cody has indicated that Allstar forward Ger Aylward won’t feature for the Cats in 2016. Aylward damaged cruciate knee ligaments in Glenmore’s recent AIB All-Ireland club JHC semi-final victory over Cork outfit Dungourney. And Cody stated yesterday that the 23-year-old forward “won’t be back” this year as the Cats seek to launch a successful defence of their Leinster and All-Ireland crowns. Aylward was one of the breakthrough stars of 2015 and his absence will be keenly felt in the coming months. The more immediate concern for Aylward and his club is tomorrow’s All-Ireland junior final against Derry outfit Eoghan Rua. “He’s just gone and he’s a huge loss,” said Cody, speaking at Nowlan Park where Glanbia confirmed a fresh three-year sponsorship deal with Kilkenny. “He had a terrific year last year but he has the injury that nobody wants, which is the killing thing. “It’s not a question of when he’ll be back, he won’t be back this year. “The cruciate is the dreaded one, and the killing thing is that it happens so simply, usually. You’re talking about nine months really, so essentially Ger’s intercounty career this year is gone. Aylward has provided hope to other Kilkenny players aiming to make a breakthrough that it can be done but Cody is disappointed that the man who scored 3-15 in last year’s championship, including 3-5 on his full debut against Wexford, won’t play a part in 2016. Cody hailed the player’s progress and admitted that it was satisfying to see Aylward make the grade. Some people do it quickly, some people may take three, four, five years, and some people can’t, with the best will in the world. “Ger’s early matches in the League, it didn’t look as if he was going to do it, but he knuckled down and put everything into it, listened to whatever he had to listen to, took all the advice there was to take. Kilkenny are also planning without Richie Power following the eight-time All-Ireland senior medallist’s recent retirement. And Cody paid a glowing tribute to the Carrickshock man. A terrific hurler, massively skilful. It showed in the last few years because he was playing through injury, limited – almost close to no serious preparation. “He came on in the All-Ireland last year and showed what he could do, but going back to the previous year’s All-Ireland, he got two goals (in the drawn game before adding another in the replay) and was just outstanding. He made a real difference. In other injury news, midfielder and 2015 All-Ireland final man of the match Michael Fennelly won’t be considered for Kilkenny’s Allianz League Division 1 opener against Waterford. The Ballyhale man is in training but not in a contact capacity as he continues to nurse ongoing groin and back issues. Elsewhere, midfielder Joe Lyng has been ruled out for six-eight weeks after damaging the AC joint in his left shoulder at training last week. Eoin Larkin won’t feature for Kilkenny until April as he is currently on peacekeeping duty with the Army in Syria. 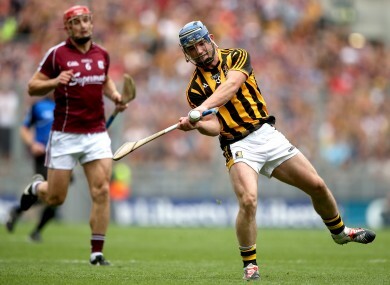 Email “‘He won’t be back this year’ – Kilkenny forward star ruled out of All-Ireland defence”. Feedback on “‘He won’t be back this year’ – Kilkenny forward star ruled out of All-Ireland defence”.